After more than one year of their young partnership the companies Sommer GmbH & Co. KG and Feige GmbH, Abfülltechnik present a good example for mutual projects. It's on the European Coatings Show 2011, hall 6, stand 230 where the companies do present a new and interface-free production and packaging line -a real innovation. With this first mutual project the companies Sommer and Feige offer to their customers of the paint-, lacquer & adhesive industry a turn-key plant for storage, mixture and filling of liquid or pasty products. Here, the entire process technology originates interface-free from one source: starting with storing, proceeding with accurate filling according to W & M, further with labelling and finally get palletized onto the truck. Whenever the Sommer and Feige engineers meet each other on customers' sites they always come to the same conclusion how big the demand is for complete production lines (Full-Liners) coming from one source. If there is envisaged or intended a new investment in the area of production plants, the results thereof are supposed to work uncomplicatedly and as efficiently as possible. This new turnkey-plant offers a good taylor-made solution which fully complies with customers' individual production requirements. Messrs. Sommer benefits from their more than 100-years-experience in building process plants and covers the design, engineering and realisation of the entire raw-material processing. Starting with storing and dosing of liquids and solids up to weighing-in of universally employable production mixers which are especially well suited for the production of medium-and high-viscousproducts. Because of the variable employment of its high-performance mixing tools, the mixer is perfectly adapting to various production conditions. It has been designed as weighing device so that raw-material can be added well dosed and a total quantity balance of the finished product can be established. After mixing of the product has been finished, it is advanced via a pumping system to the filling machine -interface-free. 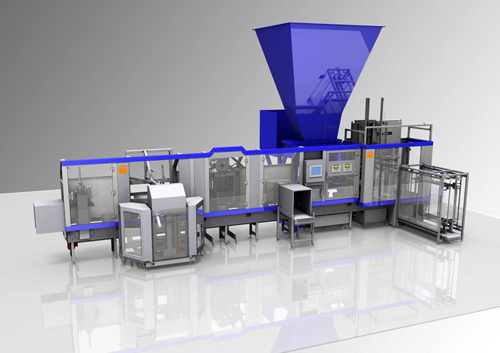 As from here on, Messrs. Feige benefits from their extensive know-how and presents on the ECS 2011 the new high-performance automatic pail filler Type 410, centrally operated via the Feige-Touch-Panel. 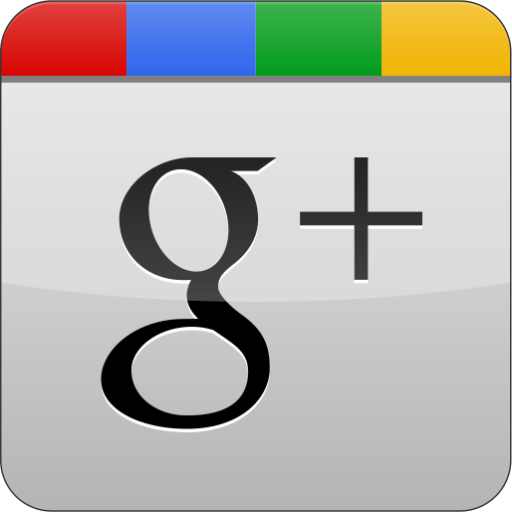 Several modules are put together and thus createan individual structure to suit customers' requirements. 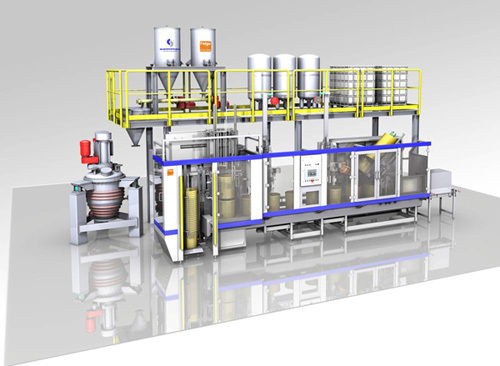 The filling line comprises a pail denester with floor-level-refill and continuous pail-infeed as well as a new filling station with high-accurate product flow control. Here, the products are dosed via a high-performance filler -accuracy according to W & M -all pail-and filling parameters entered centrally on the Feige-Touch-Panel and continuously fed in. 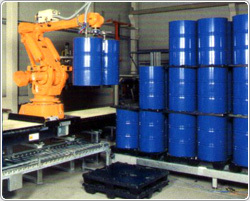 Moreover, Feige presents on the ECS 2011 as a real novelty a robot lid placer. It provides for a continous lid-supply and the central adjustment of the pail and lid parameters without format-sets, which makes packing of the products still faster and more efficient. Both partners present on the ECS an example for collaboration of mutual projects as Full-Liner. Those visitors who feel attracted and want to get inspired may have a close and intensive look at this machine and get detailed information about forward-thinking technical achievements. 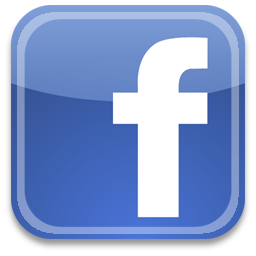 Please contact us at +49 4531 8909 -0 or refer to our contact form for detailed information regarding our products. Consistent documentation of filling results -special campaign until 2011-03-31. Machine operators know the demands of customers, authorities or management for a consistent documentation of filling results. Whether for reasons of inventory control or for the statistical recording of production outputs, the IF-USB Memory Box for Feige weighing terminals makes it particularly easy to meet these demands. 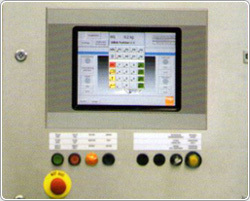 The memory box, developed for Feige weighing terminals F-ST3.4 and FS-T10(k), is on one side equipped with a USB interface for connection to a PC and on the other side with a RS232 interfacefor connection to the service interface of the Feige weigh scale and is thus turned into a fast bulk memory for your production results. We will gladly check your technical system requirements. 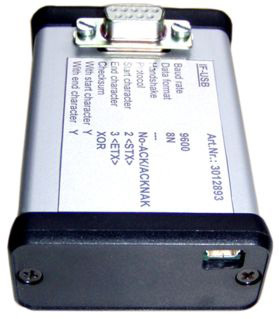 The IF-USB Memory Box can be obtained during our special campaign until 2011-03-31 inclusive of the PC program FST-Reader for weighing data analysis with a discount of 50%. Please contact us at +49 4531 8909 -222 or refer to our contact form for detailed information regarding this special offer and our products. 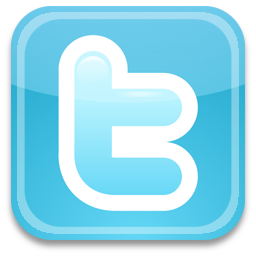 Again, the Haver Group's engineers have succeeded in combining two technologies into one system. Feige system components for automatic pail handling were successfully assembled with a Haver & Boecker 2-socket impeller packer into one automatic machine. 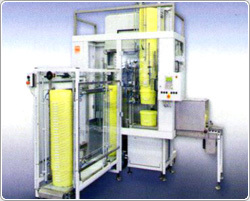 Pail sizes ranging from 5l to 20l can be filled with powder products fully automatically and with calibrated accuracy at a speed of 500 to 600 pails/ h that is otherwise common for liquids. The first order for this kind of technology was placed by a renowned German construction chemistry company. Both Feige Filling and Haver & Boecker are looking back on many years of good business relations with this customer. As it is implemented for the customer as a project from one source and for the supplier as a project within the group, thisundertaking offers enormous advantages for both business partners. Technically speaking, this automatic system consists of a pail denester with feed belt for feeding the pail pile close to the floor directly from the pallet. 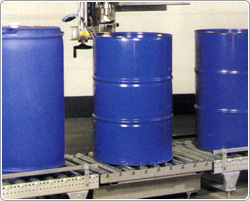 Using a special cycle sequence, the containers are positioned with millimetric accuracy via an indexing conveyor at the work stations filling, check weighing, membrane sealing, lid placing and lid pressing. 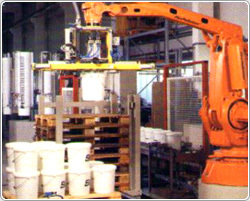 The pails are then filled, sealed and subsequently labelled and palletised in automatic mode. For this project, the 2-socket-impeller packer developed by Haver & Boecker was modified such that at the position where the filling unit is normally located it was possible to harmoniously integrate the Feige automatic pail filling maching. 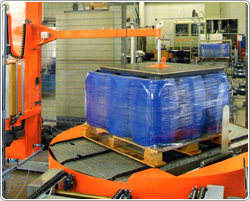 Empty containers are raised and pressed against the Haver impeller packer in a dust-tight manner. An integrated vibrating device gently compacts the product. 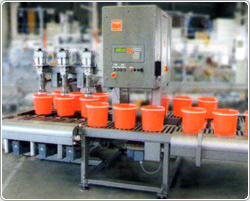 During the following work steps, the pails are sealed with a film and then closed with a lid. The concept offers a modular structure, allowing the subsequent customer request for film sealing certain products to be implemented. The automatic machine can also be equipped with other packers so that various powder products available on the market can be packed automatically, safely and with calibrated accuracy into plastic or metal pails. 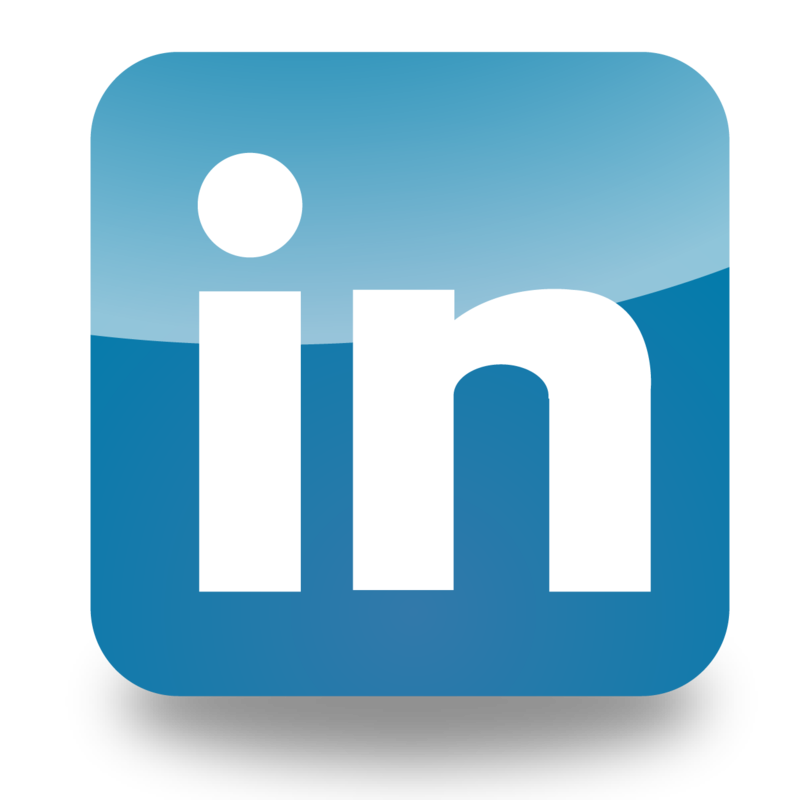 There are hardly any limits to the areas of application in the chemical and construction industry or even in food processing. 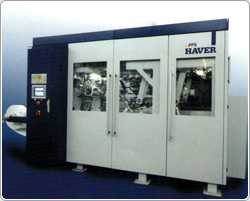 In 2007, the first symbiosis between Haver & Boecker and its subsidiary Feige was already successfully launched on the market with the development of LIFFS (Liquid In Form Fill Seal). For the purpose of filling plastic bags with liquids, the filling unit and the product flow control running on the Feige weigh scales had been successfully integrated into the Haver FFS technology. The co-operation potentials in solids and liquids filling demonstrate that the Haver & Boecker Technology Group has more and more developed into a turnkey provider, covering the entire range for filling solids and liquids into bags, pails, cans, tins, barrels or IBC.